Please stop what you are doing and watch this! I had the pleasure of seeing William Joyce talk about his new series Guardians of Childhood at the Texas Book Festival. Thanks to Alan Silberberg and Annette Dauphin Simon for sharing this link to The Fantastic Flying Books of Mr. Morris Lessmore from his Moonbot Studios. It has been nominated for an Academy Award. 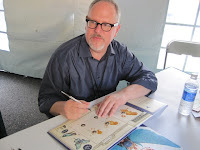 Using a variety of techniques, including miniatures, computer animation, and 2D animation, award‐winning author and illustrator William Joyce and co‐director Brandon Oldenburg present a hybrid style of animation that harkens back to silent films and MGM Technicolor musicals. I've been urging people to watch this too! It's so magical and lovely and transporting. I do hope it wins the oscar! My husband bought the app for his iPad, and it is enchanting. Then I found out about the Oscar nominated short film....definitely rooting for it too.